Please join us on Friday 10th August at The Aldergate Club for an evening of music with Velvet Souls singing 50’s hits through to current chart toppers. Doors open at 7pm – event starts at 8pm. Tickets cost £2.50 (children are free), tickets can be purchased on the door. Please join us on Friday 25th May from 8pm for Big Al’s Listening Music Quiz at The Aldergate Club. Tickets are £5 per person which will include a buffet. Tickets can be purchased by contacting Paula Da-Silva on paula@twcsc.co.uk or calling 01827 899590. Tickets can also be purchased direct from the club. If you are paying via Just Giving please remember to leave your name and amount of tickets required. All proceeds will go directly back to the Tamworth Wellbeing & Cancer Support Centre. Please join us at our Rock Choir Concert ‘the choir that rocks’ with Sonia Eyre. Tickets are £7 each including refreshments (a glass of wine or a soft drink). Tickets can be paid for either by cash or by donating to the Just Giving page, but please remember to leave your name and number of tickets required. All proceeds will be going to the Tamworth Wellbeing & Cancer Support Centre. Please join us on Friday 21st September from 8pm for our Beer & Skittles night at The Aldergate Club. On Friday 16th November at Two Gates Club we will be hosting a charity event in aid of Tamworth Wellbeing & Cancer Support Centre. The evening will be hosted by Mark Paul from Radio Tamworth, and we will be entertained by a fabulous Take That tribute act Ta3ke. Joanna Parkin & Rebecca Head from Four Oaks Legal Services will be available at Tamworth Wellbeing & Cancer Support Centre on Friday 6th April between 11.30am – 2pm.11.00 -12.30 – Please contact Paula if you would prefer a ‘timed slot’ which might be of benefit to more complex queries. It will be held at Two Gates Club, 6 Dosthill Road, Tamworth, Staffs, B77 1HU. Doors open at 7pm with the event starting at 7.30pm. You can pay for your tickets by cash, cheque or via Just Giving. Our address is 44 Craven, Stonydelph, Tamworth, Staffs, B77 4HH. Please join us on Saturday April 29th from 7pm at Wilnecote Parish Hall, Tamworth for our ‘Ladies Night’. It will be a fun filled night of music with a tombola, raffle and DJ. Tickets are £10 which includes a welcome cocktail. There isn’t a drinks license for this event so please remember to bring your own drinks and snacks if you wish. 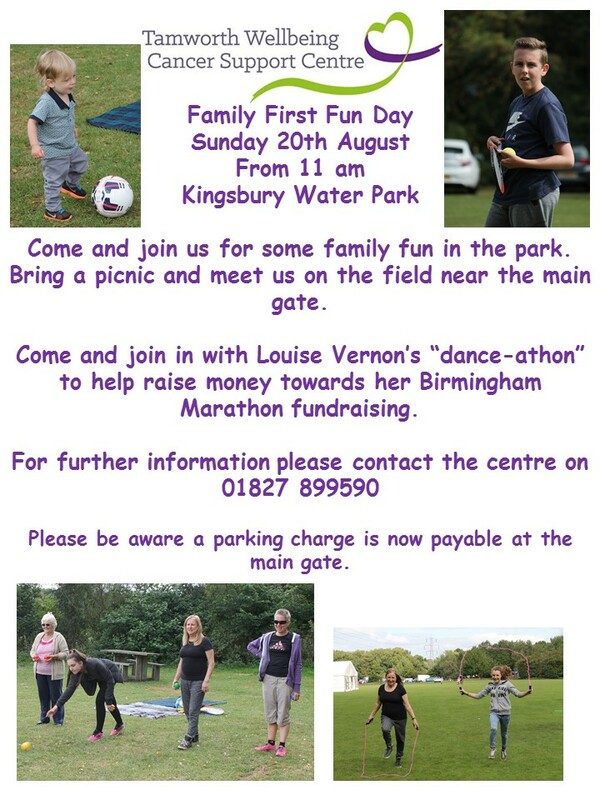 Due to the fact that we all had such a lovely time at Kingsbury Water Park last month we decided it might be nice to try to squeeze another one in before the majority of the children go back to school. We thought it would nice to have this one on a weekend so that people who work in the week can come too and we can make it a proper family affair. Bring a picnic, join us for fun and games in the park. All clients, supporters and volunteers are welcome. Charges apply to park at the water park. Meet at the main entrance at 11am. Public toilets and cafe are located nearby. We will be there whatever the weather so bring umbrellas and wellies if you need them! Come and join us at our MacMillan Coffee Morning, to raise money for MacMillan. We will also be holding a table top sale and the proceeds from this will go to the Tamworth Wellbeing & Cancer Support Centre. Charity Christmas Ball in aid of the Tamworth Wellbeing & Cancer Support Centre. On Saturday 12th December 2015 at the Tower Suite, Drayton Manor. Dress code – anything ‘Royal’ or formal black tie evening wear. £20 non-refundable deposit required as soon as possible – final payment required by 14th November. Main Course will be Roast Turkey with sausage & bacon roll, stuffing, roast chateau potatoes, chantenay carrots, mixed greens, pan gravy. Vegetarian option – Portobello Mushroom Wellington with fondant potato and butternut squash puree. Dessert will be Profiteroles filled with chantilly cream, warm chocolate sauce. A very brave former cancer patient from Tamworth will be taking the plunge to have her long flowing locks shaved off to raise money for charity. Sue Philbin, from Glascote, will be having her 28 inch long hair shaved off on Thursday 18th June which will be 7 years to the day when she finished her cancer treatment. The Tamworth Wellbeing & Cancer Support Centre supports people affected by cancer and other chronic illnesses. Like many of the volunteers at the centre Sue was initially a client who soon became a volunteer as she wanted to offer the same support to other people that she had received.